It seems like every single day, one can turn to social media to learn of yet again, another customer service horror story. And chances are, if it is one of my friends who is doing the talking, nine times out of ten, I’ll side with them, and share their post with even more friends. With this, it doesn’t take long to get the word out that “said” business, has some work to do beyond perhaps just that one bad customer service transaction, but also, with reputation management, as well. In this day and age, it doesn’t take long for word to spread. 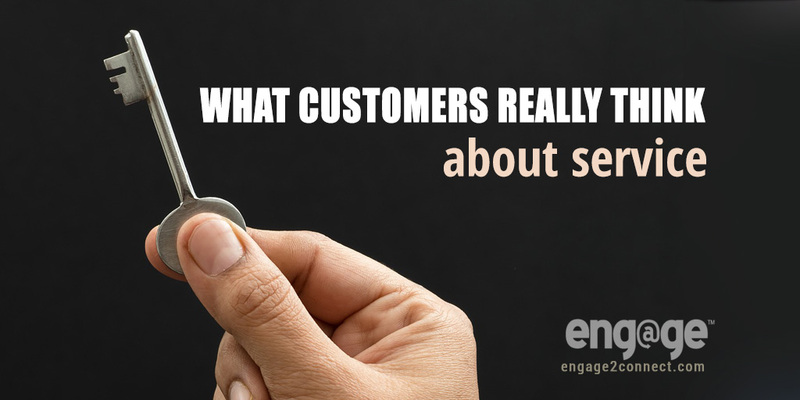 When was the last time you had a bad customer service experience? And, what did you do in response? Chances are, you did what most people do, and that was, talk. Recently, a report by Genesys was released that shared their findings about what consumers really thought about customer service. In the report, it primarily focused on customer service over the phone. That said, the data can easily be translated to all areas where point of contact between consumer and business can occur. As expected, the report found that nearly half the respondents discussed the bad customer service experience face-to-face with family and friends. Surprisingly, only a quarter took action by spreading the word on social media. But, the one number that really stood out was that of those surveyed, 49% dumped a brand after one bad experience. In a digital world, there are choices. And, people have no problem at all moving on to the next business in line to get their needs met. 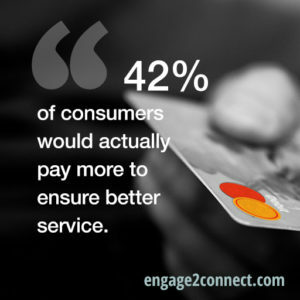 Matter of fact, in this same report, Genesys found that 42% of consumers would actually pay more to ensure better service. How much more? Respondents said they’d pay an extra 6-10% more, all just for better service. And that’s after the fact that more than half of consumers, after having had one bad customer service experience, already jumped ship to a different service provider. Houston, we have a problem. The good news is that it’s not all bad news. Still, a majority of consumers say that their last customer service experience was positive. But, within the bad news, what are some areas that both need to be addressed and improved in order to provide consumers a better overall service experience? We’ve all been there. You know, that dreaded phone call when we’re put on hold, for what seems like a good 30 minutes. Often times, if not serenaded by some Kenny G on-hold music, we find ourselves wondering if they forgot about us. Once that starts, we then debate hanging up and calling back, of course all the while weighing the risk of losing our place in the queue. Don’t laugh, you know what I am talking about. The good news is that we’re not alone in this. Being placed on hold is commonly cited as one of the leading customer service frustrations for consumers, who are just wanting, most often, simple answers. But, for those who hold out and actually get to speak with a live agent before being transferred to another live agent, it is here where a second most common frustration for consumers occurs, and that is in being given the wrong information. Raise your hand, if you too, have experienced this before. There’s one more frustration that consumers have with businesses when it comes to getting their needs met, questions answered, and service provided, and that is in being given too many options before reaching an agent. Have you ever screamed the words, “I JUST WANT TO TALK TO A PERSON! !” before? So, what can businesses do to help ensure that their customers are being provided a positive experience with their brand? What Do Customers Want When It Comes To Service? If there are a few things we can learn from what customers really think about their service experiences, it’s what customers want. So, what can we learn from this? And, how can we translate this between an over the phone experience to even a social media interaction experience? 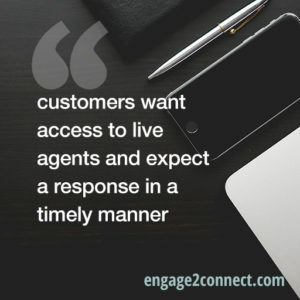 For one thing, customers want to speak or at least be acknowledged by a live agent as quickly as possible. Certainly, this might not always be possible. Sometimes, it can get busy. But in all cases, it is mission critical to always respond in a timely manner. And this goes for social media, too. Are you listening to social media for people who are seeking to contact you? A common stat that has been used in many-a-presentations citing All Facebook states that an astounding 95% of posts made by audiences on Facebook brand pages are never responded to. Ouch! So, customers want access to live agents and expect a response in a timely manner. But what else do they want? Are you ready for this? Customers want knowledgeable service. How well do you know your stuff? And oftentimes, more importantly, how well does your staff know your stuff? The last thing customers want (although appreciated), is to be passed on to different staff members just to get an answer. Appreciated because they respect honesty if a customer service rep does not have the answer, but when it becomes a game of telephone where the customer never gets the same answer twice, they’ll begin to wonder. How do we solve this? And what should businesses be doing to ensure they are providing the customers with a seamless experience that keeps them coming back for more? But, in this world of social media where people are using various platforms to reach businesses, let’s add a 4th key area to audit to ensure your business is meeting your customers right where they are and that is in the area of listening. Are you listening to social media for where your business is being mentioned, tagged, messaged, reviewed, and even shared? Remember that 95% number from allfacebook.com? If you want to stand out, just being in the 5% of businesses that do respond will go a long way with reputation management. Why? Because others are watching, too. In the end, with 49% of customers dumping a business because of one bad customer service experience, is it worth it? Not in this day and age. Choices are many and competition is everywhere. How will you stand out in the crowd? By giving customers not only what they want, but also, what they expect. And that’s a positive and seamless experience. And that starts with the areas mentioned above.